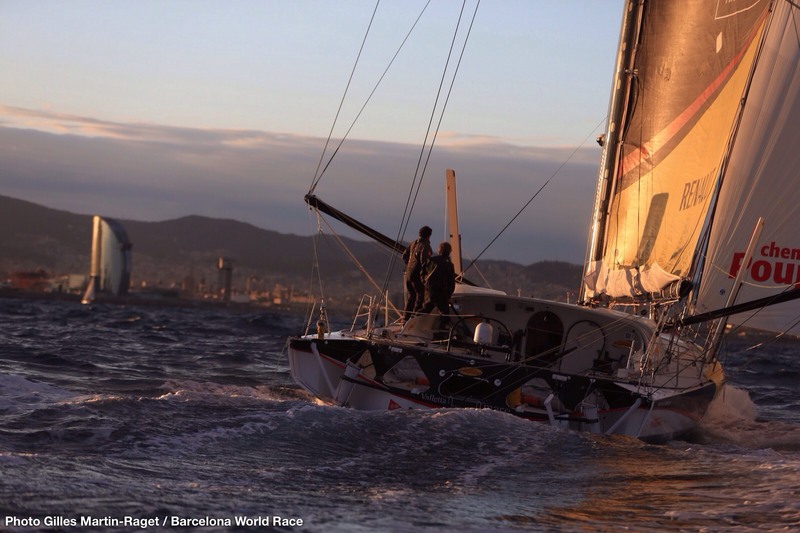 Jean Le Cam and Bernard Stamm on board Cheminées Poujoulat have become the first team to return to the Mediterranean in the Barcelona World Race, crossing the longitude of Gibraltar this morning at 08.30 (UTC). The leaders kept a course close to the North African shore, before a rapid transit through the Straits in a 20-knot southerly. 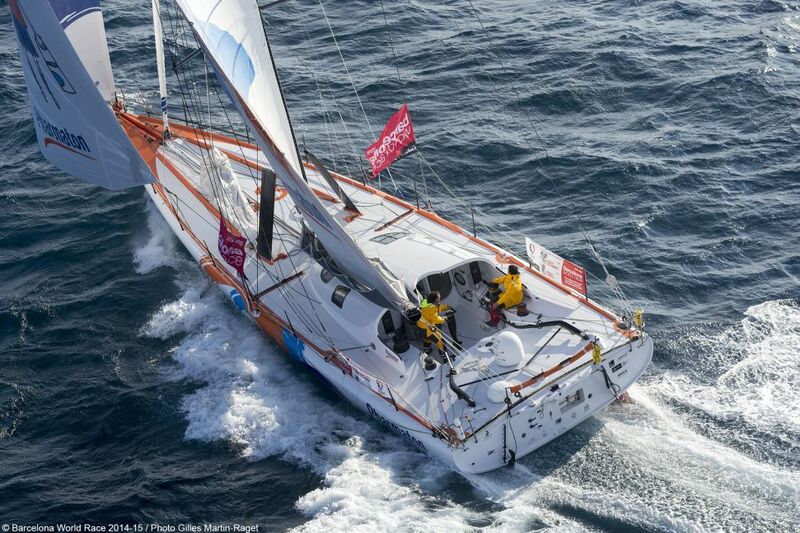 Cheminées Poujoulat now has fewer than 500 miles to cover before their arrival at the finish in Barcelona, and they are currently expected to arrive at lunchtime on Wednesday, March 25. They are currently heading north-east, on the Spanish side of the Alboran Sea, and can expect a period of upwind sailing in 5-10 knot winds over the next 24 hours due to a high pressure system south of Spain. 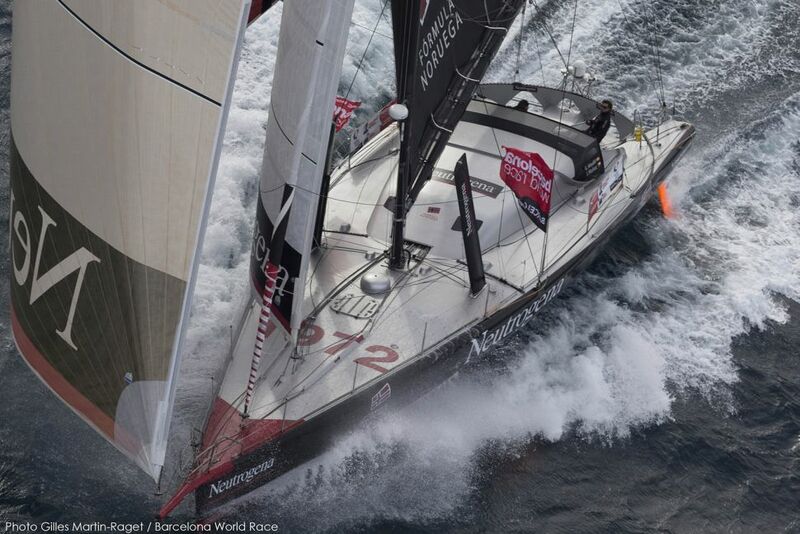 Second-placed Neutrogena is now on an east-bound course. Having reached the limits of the north-easterly trade winds yesterday afternoon, Guillermo Altadill and Jose Munoz made the turn for Europe ye sterday evening and are now sailing in more northerly breezes of 15-20 knots. Around 125 miles to the south-west, GAES Centros Auditivos has shadowed their manoeuvre in third and is now also heading east. In the duel to cross into the Northern Hemisphere, it was One Planet One Ocean and Pharmaton who arrived at the Equator in fourth place. Aleix Gelabert and Didac Costa crossed the 0° Latitude this afternoon at 14.20 (UTC), six days and 18 hours after third placed GAES Centros Auditivos. He and Costa have been pleased with their performance and report no problems on board, commenting: “We will keep pushing to try to maintain the fourth place, which we are going to have to do because We Are Water are going to push also, it’s going to be really difficult to be further ahead of them. But the boat is in good condition, we don’t have any issue with anything, so we can go 100% for the moment, and we will try to go as fast as possible as we always do. About 170 miles to the west, We Are Water are experiencing a tortuous Doldrums, averaging just 1.5 knots boat speed and VMG since this morning’s position report. The Garcia brothers are expected to cross the Equator around two hours after Gelabert and Costa, but may benefit from stronger breezes to the west this afternoon. Sixth placed Renault Captur is predicted to cross the Equator in one week’s time. At this afternoon’s 1400hrs position report they were the fastest in fleet, heading north-east at over 11 knots in 15-20 knot northerlies, around 170 miles off the coast of Brazil. “I landed on my lef t shoulder and my head leaving the former dislocated and a large egg on my forehead. I screamed for Nandor who rushed from his bunk to help me sit up, only for my head to turn and I was forced to lay back in confused agony. Having previously dislodged my right shoulder and had it surgically repaired in 2012, I only hope that I can avoid that fate again with my new injury. I have good range of movement but significant pain and a significant sense of weakness in the joint. “These days we have been pushing a little bit. We are trying to go out of the Doldrums as fast as possible. I presume that We Are Water are doing the same because everyone thinks it is very important to get out of the Doldrums as soon as possible. 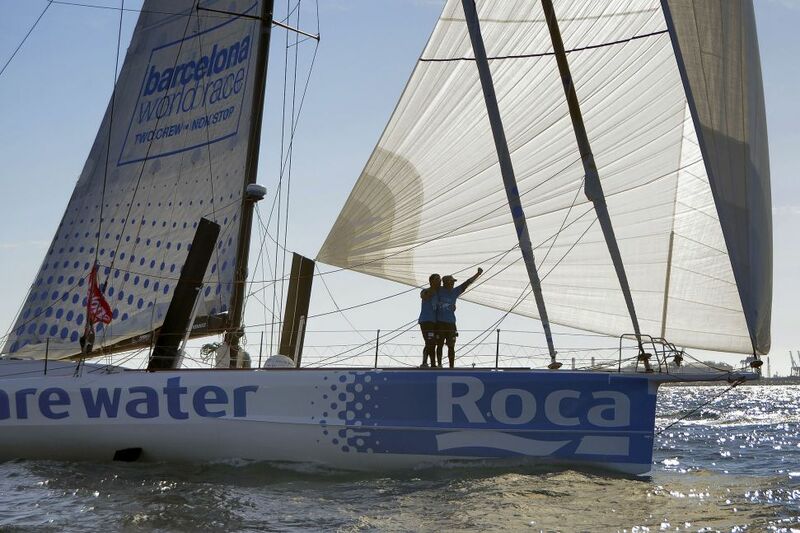 We are happy to have We Are Water close to us because then we are pushing a little bit more, and going fast to Barcelona is our final goal. “We will keep pushing to try to maintain the fourth place, which we are going to have to do because We Are Water are going to push also, it’s going to be really difficult to be further ahead of them. But the boat is in good condition, we don’t have any issue with anything, so we can go 100% for the moment, and we will try to go as fast as possible as we always do. “We know that we are faster than We Are Water but only because we have different weather conditions and we have been lucky with this, and our decisions have been very good. In theory their boat is a little bit faster so we try to go as fast as possible and if we make better times than them then perfect, but if not then we know that’s normal and just to keep going as fast as we can. “These days we have to think a little bit about everything. The Doldrums obviously, because we have showers, we have thunderstorms, and we have to be very careful because here we can lose a lot. We can gain a little bit but we can lose a lot. “As expected the wind built from the NW with the approach of the concentrated depression that has been catching us up these last few days. Finally the cold front broke over with 40 knot gusts and a deluge of rain that flattened the seas and turned the crests a smoky white. “There is always an abrupt change in the wind direction following a cold front and the new wind from the SW allowed us to ease the sheets and make tracks to the north on a broad reach. However, the boat slammed horribly in the confused waves left by the intersection of the new wind with the older established wave pattern. We were trying to avoid the boat from taking a beating and instead I took one myself. Coming in from the cockpit a particularly large slam wrenched away my slippery hand hold and I pitched head first into the bilge. “I landed on my left shoulder and my head leaving the former dislocated and a large egg on my forehead. I screamed for Nandor who r ushed from his bunk to help me sit up, only for my head to turn and I was forced to lay back in confused agony. Having previously dislodged my right shoulder and had it surgically repaired in 2012, I only hope that I can avoid that fate again with my new injury. I have good range of movement but significant pain and a significant sense of weakness in the joint.